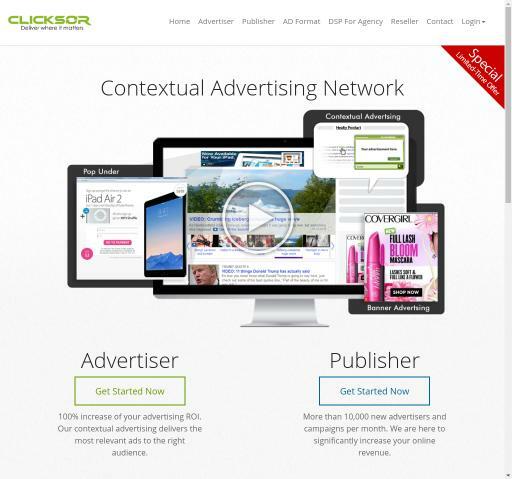 Clicksor Video, Text, Popunder, Interstitial, Banner advertising network details. Clicksor is a Contextual Advertising Network that focuses on constantly improving their solutions and maintaining their growth in a market that is continuously changing. This platform is one of the most effective when it comes to costs on targeted customers. For Advertisers, Clicksor guarantees precise and effective ads, design to target the right audience; quality traffic with over 150K publisher networks; a real-time report of the campaign performance. For Publishers, you benefit from weekly payment using multiple payment options, high-quality ads, and diverse ad formats. For more details regarding the Clicksor Platform, check the Information section.